This beautiful Kokopelli nite lite acts like a small beacon in the night, lighting your way as you walk through a darkened room or hallway. You'll love the cutouts in this petroglyph design that is made to look like rock art. 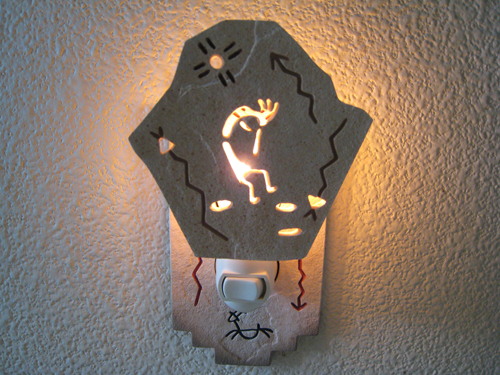 Made from Garden Cast, this Kokopelli night light measures approximately 4 inches x 4 inches (not including the base that plugs into the wall, has a toggle switch and comes with a small light. Makes a unique and affordable gift. 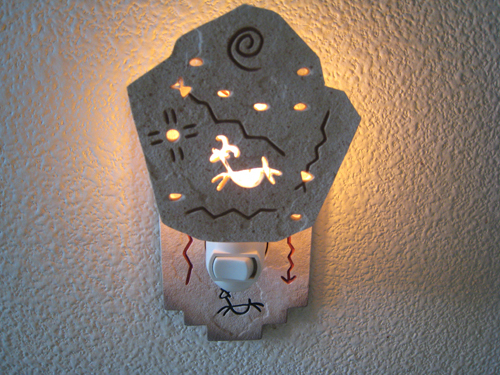 Choose from the Kokopelli nite lite or the Ram night light pictured below. Ships via Priority Mail. Shipping cost is approximately $6 within the continental United States. Shipping is added at the time of order processing. Order your Kokopelli nite lite or Ram night light today. For a little variety, order both.